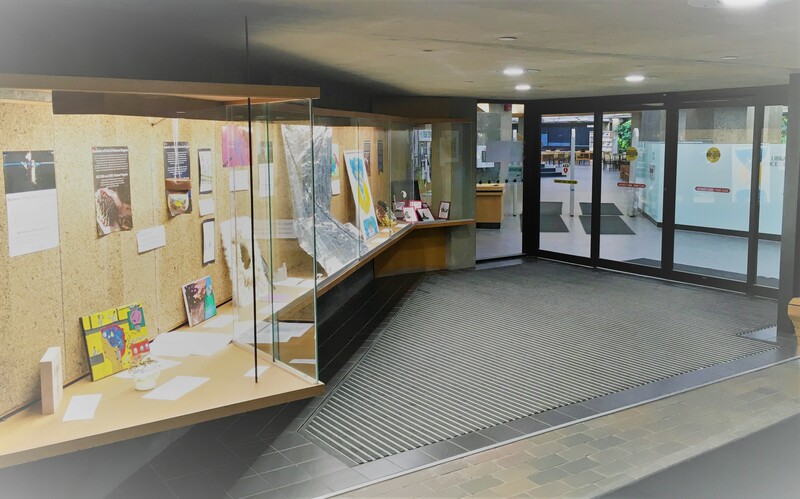 The display case at the entrance to the Bata Library is a central and prominent area on the Symons Campus for displaying information about programs, events and services offered or presented by University Departments, Programs or student groups. The Library has enabled a self-service booking procedure through the University Room Booking module for internal university departments and groups. The Display Case must be booked by a Trent student, staff or faculty member using a Trent login. Please see the Terms and Conditions for booking the display case. Bookings of the Display Case are for a period of one week and are reserved on a first-come, first-served basis. There will be a $20 fee for booking the display case, which may be paid by university transfer or credit card. Bookings can be made up to 1 year in advance of the desired time slot. The Library cannot guarantee that a desired date for the display case will be available to any group. We recommend booking early in the academic year as there is a high demand for use of this space. Internal university administrative units, programs, departments or organizations must login to the University Room Booking module to book the Display Case. Choose Self Service and select Library Display Case. Choose the Sunday with a start time of 8:00 am and and end time of 8:30 am for the week you would like to book. Bookings are for a period of one week (from Sunday to Saturday). Confirmed bookings will be shown on the calendar on the Sunday but reserves the Display Case for the whole week. A key is required to access the display case which may be picked up at the Library Service desk. Exhibitors are responsible for removing the display material no later than Saturday at 4 pm. There will be an additional charge of $20 to any group who does not remove their material by the appropriate time and date. Unclaimed display items may be disposed of after one week. If you need to cancel your booking, you may do so using the Room booking module under MyRoomBookings. The Library reserves first right for the use of its display case. Therefore, the Library shall have the right to displace any booking provided a minimum of 3 weeks notice is given. The Library is no longer able to provide space in the Display Case to external Community organizations without Trent affiliation due to liability issues. The Library takes no responsibility for the security or welfare of exhibits at any time, including installation or dismantling of the display. By agreeing to the terms and conditions, the exhibitor indemnifies the Library from any responsibility for loss or damage. Insurance coverage, if needed, is the responsibility of the exhibitor. The key for the display case may be picked up at the Library Service desk. There is a $20 charge for use of the display case. It may be paid by university transfer or credit card using the Display Case Payment Form. Please print the form, scan and email to libraryadministration@trentu.ca, fax to 705-748-1126 or send to Bata Library, Suite 412. Bookings are from Sunday to Saturday at 4 pm. Exhibitors must remove the display material by 4 pm on Saturday. Material left in the display case after 4 pm will be removed by Library staff at an additional cost of $20. The Library takes no responsibility for the security or welfare of exhibits at any time, including installation or dismantling. Insurance coverage, if needed, is the responsibility of the exhibitor.